The final original episode of “The Oprah Winfrey Show” will air May 25. Winfrey’s Chicago-based Harpo Productions confirmed the date Friday. 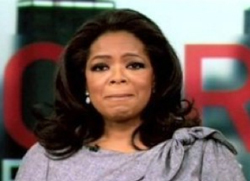 Winfrey announced live on the show in November 2009 that she would end its run after 25 years. She since has launched cable’s Oprah Winfrey Network. “The Oprah Winfrey Show” has been in reruns for the last few weeks. But Winfrey tweeted Thursday that she was “hard at work planning the final shows” and new episodes would begin April 7. The final episode brings an end to what has been television’s top-rated talk show for more than two decades. It airs in 145 countries worldwide.